TGIF in the house! Another fall weekend is here, and for me, that means a weekend of Eagles football, Flyers hockey, and all things pumpkin spice. I L-O-V-E this time of year. Allow me to introduce myself. I’m MarlaJan, and I blog at my little space on the interwebs, Luck Fupus. I’m also the NJ state rep for the Northeast Bloggers Network, and I’m hoping that allows me to get to know many more of you! Now that fall is upon us, it’s also that time of year (at least in my area) where every weekend is a walk to support some type of cause. If you know me, you know I love a good cause. 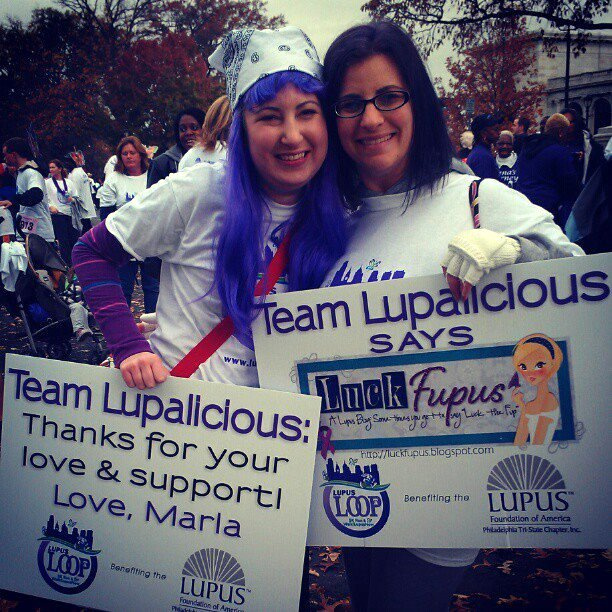 I’m here to tell you about lupus and the 2013 Philadelphia Lupus Loop. You may have heard about lupus on the show House. In Dr. House’s world, it’s never lupus. In my world, after 6+ months of playing Mystery Diagnosis, it was. I was diagnosed with lupus and other autoimmune diseases in August of 2008. It’s been a long road, and what started as fairly mild disease activity, eventually led to major organ involvement and my having to go out on long-term disability from a job I truly adored. Unfortunately, lupus doesn’t get the “publicity” nor the funding it deserves, so, I’m going to educate you, Friday 5 style, on a few things about the disease. Put on your thinking caps, because there will be a test at the end. Lupus is a chronic, autoimmune disease that can damage any part of the body. In lupus, your immune system can’t tell the difference between foreign invaders and your body’s healthy tissues and creates autoantibodies that attack healthy tissue, causing inflammation, pain and damage to various parts of the body, including the lungs, heart, blood, joints, kidneys, brain and skin. Research estimates that 1.5million Americans have lupus, and it is more prevalent than AIDS, sickle cell anemia, cerebral palsy, cystic fibrosis and multiple sclerosis combined. Ninety percent of the people who develop lupus are women. Men can also develop lupus, and their disease can be more severe in some organs. Common symptoms of lupus are hair loss, extreme fatigue, butterfly-shaped rash across the cheeks and nose, abnormal blood clotting, ulcers in the nose or mouth, painful/swollen joints, headaches and fever. Factors that may trigger a lupus flare include ultra-violet light, infections and stress. More information can be found at the Lupus Foundation of America. The 22nd annual Philadelphia Lupus Loop Walk To End Lupus Now is on October 27th, 2013. This is my sixth year as team captain for Team Lupalicious. My BFF and big sister Brie from A Breezy Life and me at the 2012 Lupus Loop! *I’m very close to 100 GFC followers, and once I get there, I’ll be doing a groovy giveaway! I think I already commented this on your blog, but I have an exam on lupus next Friday! I honestly didn't even know about it until I learned about it in class, so I think this topic definitely needs more exposure. Good luck at your walk! I can't wait to follow along with your blog.